Yifu Lin, J. and Wang, Y. 2014. China-Africa win-win strategy for job creation and transformation. GREAT Insights, Volume 3, Issue 4. April 2014. Africa is a continent with huge potentials to grow at 8% or more in the next decade, but it is not creating enough jobs for its young workforce. A win-win strategy for job creation in Africa combines infrastructure and industrial parks to attract labour-intensive sectors, as our research shows. When China started its economic transformation in 1979, it was poorer than most of the Sub-Saharan African (SSA) countries. It was a poor agrarian economy, with 81% of its population living in rural areas. Its per capita income was US$154 in 1978, less than one-third of the average in SSA countries. At that time, China’s main export was primary products or processed primary products – in as late as 1984, 50% of China’s exports comprised of crude oil, coal, animals, and agricultural products. Since then, through learning, opening and reforms, China has achieved a miraculous average annual growth rate of 9.8%. Its per capita income reached US$6,100 in 2012, more than four times the average in SSA countries. China has also become the world’s largest manufacturing base and the number one exporter, creating jobs for millions of workers. Is it possible for the low-income African countries to achieve the same? Yes, if these countries can follow their comparative advantage and transform their natural endowments (or “what the country possesses”) to productive capacity (or “what the country can potentially do well”) through smart strategies. In 2008 when I was appointed as the Chief Economist and Senior Vice President of the World Bank, the global financial crisis was already brewing. I pointed out that the macro policy must “go beyond the Keynesianism”, and proposed a “Global Infrastructure Initiative” coordinated infrastructure initiative will (a) increase aggregate demand in the short run and (b) propel growth in both the advanced industrial countries as well as the low-income countries in the long run. Investing in infrastructure alone, however, is not sufficient to generate millions of jobs. Our new idea in this joint paper with Yan Wang is to combine “bottleneck releasing” infrastructure with cluster-based industrial parks, aimed at attracting labour-intensive industries from emerging market economies experiencing rising labour cost and industrial upgrading. In particular, China’s labour cost has been rising rapidly from US$150 per month in 2005, to US$500 in 2012, and to reach over US$600 in coastal regions in 2013, representing an annual growth rate of 15% plus currency appreciation of nearly 3% annually in the past few years. More Chinese enterprises are facing the pressure of seeking low-cost locations and ‘going global’. China has an estimated 85 million workers in manufacturing, most of them in labour-intensive sectors, as compared to 9.7 million in Japan in 1960 and 2.3 million in Korea in 1980. China’s industrial upgrading will open great opportunities for labour abundant, lower-income countries to produce labour-intensive light-manufacturing goods that China leaves behind. African countries can benefit from seizing the opportunities to attract labour-intensive enterprises relocating from China. In addition, the availability of outward foreign direct investment (FDI) enables SSA countries to overcome the financing constraints and take advantage of enterprises relocating from China and other emerging markets. Data shows that China’s outward FDI rose rapidly to over US$84 billion in 2012, with Russia, Korea, India, and Brazil following. A small but increasing share of China’s outward FDI is flowing to Africa, and manufacturing is its key sector. From 2009 to 2012, Chinese enterprises’ direct investment volume in Africa’s manufacturing sector totaled US$1.33 billion. By the end of 2012, China’s investment in Africa’s manufacturing industry had reached US$3.43 billion. But these official statistics may be an underestimation of the actual flows, in the order of one to three. The role of cluster-based industrial parks has been proven by the successful experiences of emerging markets. In particular, investing in these parks can 1) provide a “bundling” of public services in a geographically concentrated area; 2) improve the efficiency of limited government funding/budget for infrastructure; 3) facilitate cluster development, or agglomeration of certain industries; 4) propel urban development and conglomeration of services; and therefore 5) they are conducive to growth, job creation, and income generation. In particular, China has been supporting several industrial parks or Special Economic Zones in Africa aimed at improving investment climate and encouraging outward direct investment into these low-income developing countries if there is a need. In total, China has jointly established six industrial zones in Africa. As of 2012, over 80 companies have signed agreements and settled in these industrial zones, creating over 11,000 jobs for African workers. Huajian Shoe Factory in Ethiopia provides a convincing example for the approach of building cluster-base industrial parks. 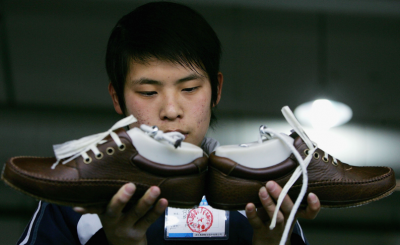 According to research done by The World Bank in 2010, the wage rate of the footwear industry in Ethiopia is one-eighth to one-tenth of that in China, or about one-half of that in Vietnam, while its labour productivity is about 70% of that in China, almost the same as Vietnam’s, so Ethiopia is highly competitive in the footwear industry in terms of factor costs of production. But in 2010, China had about 19 million workers in its footwear industry, and Vietnam 1.2 million, while Ethiopia had only 8,000 workers. Informed by the research finding and the rising wages and pending relocation of many Chinese shoe factories to other low-income countries, late Prime Minister Meles Zenawi came to Shenzhen to invite Chinese shoe manufacturers to invest in Ethiopia in August 2011. The Chairman of the Huajian Group, a designer shoes manufacturer, Mr. Huarong Zhang, visited Addis Ababa in October in 2011, convinced by the opportunity and established a shoe factory in the Oriental Industrial Park near Addis Ababa in January 2012, trained local workers and started exporting to the US market, all within the time span of four months. More than 90 Ethiopian employees were sent to China for technical training and familiarisation in corporate culture. The company has also deployed some key managerial personnel in Ethiopia to provide ground support. Now the factory hires 2,500 Ethiopian workers (August 2013) and plans to hire 30,000 by 2016. By the end of 2012, with 57% of market share, Huajian had more than doubled Ethiopia’s shoe exports. Utilising the Original Equipment Manufacture (OEM) model that facilitates learning, tacit knowledge transfer, and capacity development. It also takes advantage of trade agreements such as African Growth and Opportunity Act (AGOA) in the US and the Everything but Arms (EBA) in the EU. Could Huajian have achieved these quick results in four months without the Oriental Industrial Park? It is highly unlikely. Despite rapid growth, less than one fifth of Africa’s young workers find waged employment. But there is no reason for despair. Just as China and Vietnam have learned from the faster-growing East Asian newly industrialized economies and maintained rapid GDP growth of nearly 10% a year in the past decades, African countries can also achieve the same. In particular, they can seize the opportunities of labour-intensive industries relocating from China and other emerging markets. Through building infrastructure smartly around cluster- based industrial parks and attracting foreign investors, a win-win strategy can achieve both employment generation and capacity development for many years to come. Dr. Justin Yifu Lin (left) is the Honorary Dean at the National School of Development (NSD), Peking University, China and former Chief Economist of The World Bank. Dr. Yan Wang (right) is a Senior Visiting Fellow at National School of Development, Peking University, China and Visiting Professor atSchool of Business, George Washington University, U.S.A.
2. Lin. J.Y. 2009. Beyond Keynesianism: the Necessity of a Globally Coordinated Solution, Harvard International Review, 31(2), Summer 2009:14-17; Lin, J.Y. 2011a. A Pro-Growth Response to the Crisis. Intereconomics: Review of European Economic Policy, 46(6), Nov/Dec 2011: 321-326; Lin, J.Y. 2013. Against the Consensus: Reflections on the Great Recession, Cambridge: Cambridge University Press. 3. Lin, J.Y. 2012b. From Flying Geese to Leading Dragons: New Opportunities and Strategies for Structural Transformation in Developing Countries. Global Policy, 3 (4): 397‒409. Chandra, V., J.Y. Lin, and Y. Wang. 2013. Leading Dragon Phenomenon: New Opportunities for Catch-up in Low-Income Countries. Asian Development Review, 30(1): 52‒84; Lin, J.Y. and Y. Wang. 2013. ‘Beyond the Marshall Plan: A Global Structural Transformation Fund’ Background research paper for the UN High Level Panel on the Post-2015 Development Agenda. Available here. 4. UNCTAD. 2013. World Investment Report 2013: Global Value Chains: Investment and Trade for Development. United Nations: New York and Geneva. 5. Shen, X. 2013. Private Chinese Investment in Africa: Myths and Realities. World Bank Policy Research Working paper 6311. Washington, DC: World Bank. 6. Monga, C. 2013. The Mechanics of Job Creation: Seizing the New Dividends of Globalization. Policy Research Working Paper 6661. Washington, DC: World Bank. 7. Lin, J.Y. and Y. Wang. 2013. ‘Beyond the Marshall Plan: A Global Structural Transformation Fund’ Background research paper for the UN High Level Panel on the Post-2015 Development Agenda. Available here. 8. Lin, J.Y. and Y. Wang. 2014. China-Africa Cooperation in Structural Transformation: Ideas, Opportunities and Finances, UNU-WIDER working paper 2014/046. See here. 9. Bräutigam, D. and X. Tang. 2012. Economic Statecraft in China’s New Overseas Special Economic Zones: Soft Power, Business or Resource Security?. International Affairs, 88(4):799‒816. 10. ACET. 2013. African Transformation Report. Accra and Washington, DC: ACET. 11. Page, J. Africa’s Job Gap. GREAT insights Volume 3 Issue 2. February 2014. ECDPM: Maastricht. Lin, J.Y. 2011b. New Structural Economics: A Framework for Rethinking Development. World Bank Research Observer, 26(2): 193‒221. Lin, J.Y. 2012a. New Structural Economics: A Framework for Rethinking Development and Policy, Washington, DC: World Bank. MOFCOM. 2013. China Africa Economic and Trade Co-operation 2013. Published in August 2013. World Bank. 2012. Chinese FDI in Ethiopia. A World Bank Survey. Washington, DC: World Bank.